Yawn. A bit tired today. The bundles woke me at 1am with incessant thumping. I peeked at them and couldn't see anything and when it still didn't stop I went outside and checked up on them. Didn't see any cats or anything. No idea what had Rexy-boy so freaked out. Anyway, at least he stopped after that. Oh, I did want to tell you about a surprise I had last week. So, on my first day back, I got an email from reception saying a gift was there waiting for me. Um, huh what? I tried it right there at work. In fact I let a bunch of the work girls try it too. The reactions were quite mixed. I think it's quite an overwhelming smell the first time, but that might've been because we were spraying it on quite a few people in the same area. So I figured I'd give it a week and try wearing it a few more times before I told you all about it. I also had to look up who Taylor Swift was (showing my age, I know) but my 20yr old cousin was pretty jealous when I told her - haha. Okay, so I don't really see myself *buying* it in future (using the rest of this bottle, probably yes though). To be fair my perfume purchases are usually limited to duty-free en route home from an annual holiday ;) And I've been very slack in using my DKNY which I love the smell of which is why I haven't bought myself anything more since then. 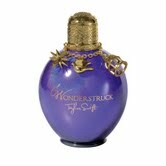 A minor thing about Wonderstruck, but I don't like the bottle. But that is probably because I have a personal preference for clear bottles so that I can see how much is left remaining. I don't think I would've even thought twice about the packaging if the bottle had been exactly the same but clear. The more I use it the more I don't mind the smell. I still find it quite strong when I first spray it on and it reminds me of something that I can't quite place ... I think it's papayas actually? "Wonderstruck is a gourmand floral; a charming and sparkling surprise of vibrant fruits, kissed by a bouquet of soft petals and a touch of sweet indulgence." I'll agree that fruits & florals describe it well. Anyway, if you are a Taylor Swift fan or just interested in this new fragrance, it'll be available in South Africa from 3th September.